This morning, Andrew and I looked at Facebook and we were reminded that, exactly one year ago, we enjoyed our first evening barbecue of the year. Today, we are huddled up indoors, as a bitter Siberian wind seems to have whipped up outside to ensure that heavy grey clouds obscure the sun as rapidly as possible. We have had a couple of weeks of very unsettled weather. This is great for the dry Andalucian landscapes, and the reservoirs have started to fill up from their previous sadly depleted levels, but the recent climate has been a tad too reminiscent of the UK for our liking. Not for us wall-to-wall sunshine, and we have had to endure what has seemed to be a very cold winter followed by a very wet early spring. Not that we are unhappy about this; we would never moan! We know that, sooner or later, the winter will disappear and we will be left with a glorious spring that will lead into a long and hot summer. It would appear that the unsettled spell may last until 20th March and then all will be right with the world once again….just in time for the arrival of our first guests of the year (phew!). So, what do we do when the weather is inclement? It has been a busy month or so for Andrew and I, with frequent flits to see the architects and look at plans for the new house. We have both been busy with work, which is always encouraging, and we have some new and exciting plans underway. The fire in our little snug has been doing overtime, and the laundry basket is overflowing with clothing that, if we did wash it, would never dry. Sadly, our walks have been knocked on the head a little as, no matter how hardy we might purport to be, driving rain holds little appeal when staggering up a steep hillside. The beginning of March each year, however, does hold some considerable excitement in Granada. During the first two weeks, the city holds a competition to discover which bar or restaurant can produce the best tapas. Now, for tapas lovers like us, this is just too thrilling a prospect. Strangely, like so many fabulous aspects of Spanish life, there was little or no publicity surrounding this event, and even now, when we mention it to Spanish and non-Spanish friends, very few people have a clue what we are drivelling on about. Even more surprising when you consider that this year saw the 10th anniversary of this festival - the Concurso Granada de Tapas. The event is organised by the Granada brewery, Cervezas Alhambra, and supported by the Ayuntamiento de Granada. We looked at the events pages on the brewery’s website a week before the start of the event and, even then, there was no mention of this gastronomic festival. However, armed with inside knowledge, we had to take advantage of this gala of gluttony. Any restaurant or bar in Granada can take part, and they submit a speciality tapas for the judging panel’s consideration. 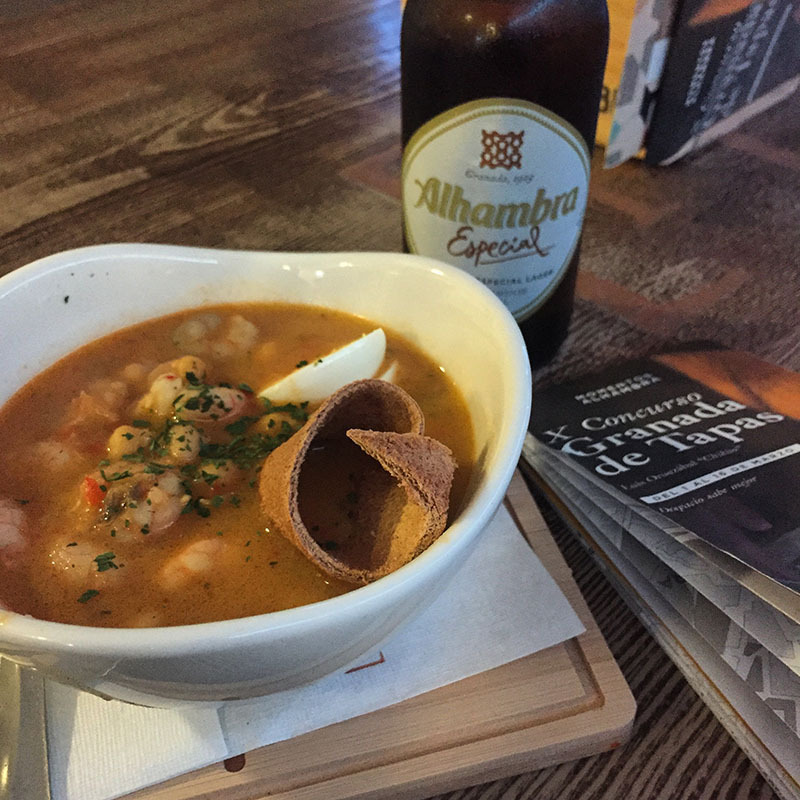 During the Concurso, this year from 1st - 16th March, anybody can go into any of the participating bars and order the Tapa del Concurso with a 20cl cerveza, for the princely sum of €2,50. The creations prepared by the chefs in the competing kitchens are often worthy of the finest tasting menus in the best restaurants. Beautiful fresh produce, presented artistically and fusing together all kinds of delicious flavours in each mouthful. There are 77 restaurants and bars taking part this year, spread across the city, so if you wanted to sample every offering you’d have to have a fairly healthy appetite, be au fait with the Granada public transport system, and have enough free time to spend 16 days eating and drinking with little time for anything else. Some respite is provided when many of the kitchens take a break from around 5pm until 8pm, at which time they start all over again. Due to work commitments, we have only had a few hours here and there to sample some of the entries, but we will squeeze in a few more before the competition ends on 16th….it’s such a hard life! Last week, between classes and recording, I had a couple of hours to kill so, in the interests of research, I dragged myself into a couple of bars that Andrew and I had not yet visited. It was during one tapa tasting that it suddenly hit me how fortunate we were, and what a delightful competition this actually was. All the food we have sampled has been absolutely delicious - delicious to look at and delicious to taste. Our first excursion was with our friend Gayle, the vivacious and indefatigable founder of Granada Tapas Tours, and we first visited a bar that we had never been to before, even though it is right in the heart of the city. Here we had the Bocado Taurino - a plate of tender oxtail wrapped in soft tortillas, and drizzled with a Pedro Ximenez reduction. Rich and tasty, but definitely only the start as far as presentation went. Our second entry was in a stylish bar in the same plaza as the first - light and modern, with large windows overlooking the hustle and bustle of the city outside. The staff here were seemingly very proud of their competition entry, and rightly so. It sounds simple in that it was a homemade crisp bread topped with an artichoke mousse, Trompettes de la mort and a little Japanese jelly. Andrew had to set his trompettes to one side, as mushrooms and Andrew do not go well together, but the flavours in this elegant little dish were quite something. Next on our menu was in another neighbouring bar, a place where we were the only customers as the kitchen staff were beginning to look at the afternoon clock, but the tapa was still available: a scrumptious crispy wonton filled with goat’s cheese and beetroot with a freeze-dried raspberry from Bérchules, a village in La Alpujarra. This collection of ingredients was served on a large spoon and made one oversized but spectacular mouthful. On our next visit to Granada, a couple of days later and armed with a map of participating bars, Andrew and I set forth for Round Two. It has to be said that, by this stage, Gayle had probably eaten her way through 20 or more…. First on our list was certainly one of my favourites. Nido de Pulpo de Motril - a delicate potato-thread nest with chargrilled local octopus on a puree of purple potatoes adorned with edible flowers. It was beautifully presented and the flavours were delightful. My mouth is watering just writing about it! 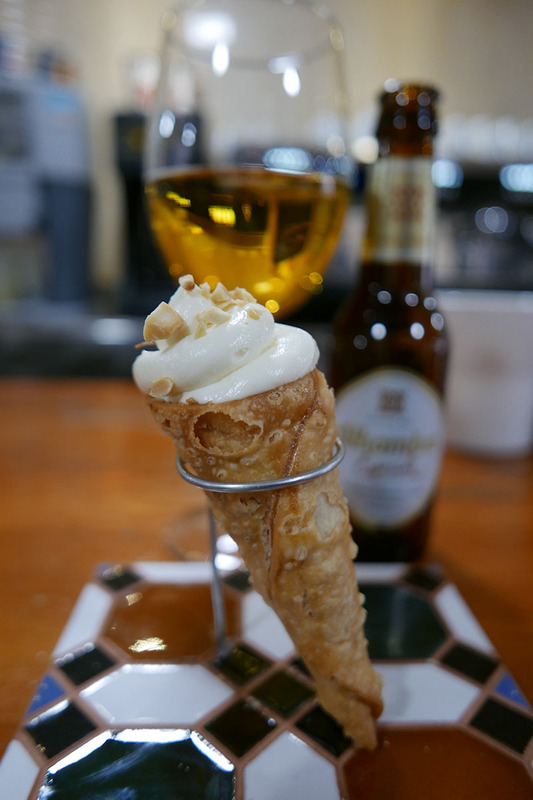 Following this, at ensuing bars, we had a crisp tortilla filled with foie, fillet of pork filled with duck pate and the intriguingly named ‘suspiro andalusi’, translated as Andalucian Sigh - a crisp cone filled with slow-cooked lamb topped with the tastiest goat’s cheese mousse. On my own on Thursday, during a break between jobs, I managed to squeeze in a couple more including a melt-in-the-mouth pork cube coated in sesame seeds on a velouté of almonds accompanied by morsels of pork crackling - absolutely gorgeous. I also sampled what I think must be a serious contender for the ‘Best Tapa' title: a warm and light-as-air Morcilla sponge with a centre of melted goat’s cheese sitting on tomato chutney and topped with a mango and lime ice-cream with red wine crisp. The name of this dish? ‘Ay, mi Pepe!’ (Pepe being the name of the chef who concocted such a delight). It was at this moment that I thought I had died and gone to heaven…and the rain and chill winds all but disappeared! The competition comes to an end with a prize-giving on 17th March, but that still gives us plenty of time to fit in another round or two, and on our list we must include creations such as Aires del sur, Patio de los esturiones, Locura de Lorca…anything with a mysterious name, really. We have a lot of foot-slogging, eating and drinking to do…..all in the name of research!